22 November 2018 - HEC Paris celebrates the opening of its first office for West and Central Africa, in Abidjan. «Characterised by its highly international education mission, it is only fitting that HEC Paris wants to be a key player in the training of future African managers; that we seek to contribute to the development of the skills of its leaders and business managers and to support the continent’s talents, which will shape the Africa of tomorrow. 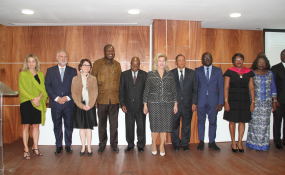 I am therefore delighted that the Republic of the Ivory Coast trusts HEC Paris to train and support the managerial and entrepreneurial development of its civil servants: more than 5000 administrative managers will be trained by 2020, » confirms Nathalie Lugagne, Associate Dean of HEC Paris Executive Education. Our program offer consists of two Executive Certificates - MUST (Management of a Strategic Unit) and Finance – and several short programs on different managerial themes that have been adapted to meet the needs of African leaders.